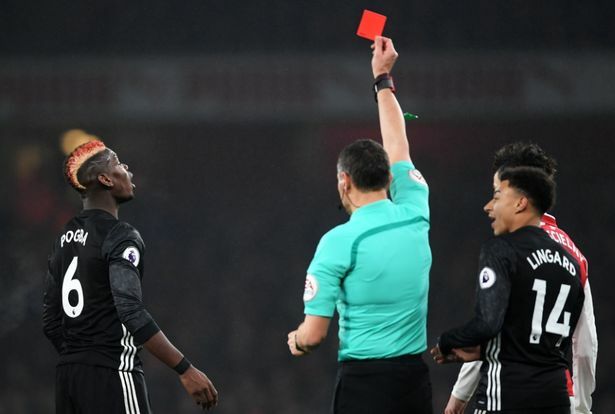 Manchester United midfielder, Paul Pogba, is facing the prospect of a long ban following his red card against Arsenal, in their 3-1 win at the Emirates on Saturday. Pogba provided two assists in the match for Antonio Valencia and Jesse Lingard, as United took control of the game. However, he was shown a straight red card for stamping on Hector Bellerin, after losing the ball. The 24-year-old is supposed to serve a regular three-match ban. But he could face further suspension, after sarcastically applauding the decision as he left the pitch. Pogba will play in the Champions League midweek against CSKA Moscow, before being forced to sit out the derby against Manchester City at Old Trafford on December 10. He will also miss subsequent games at home to Bournemouth and away at West Brom.